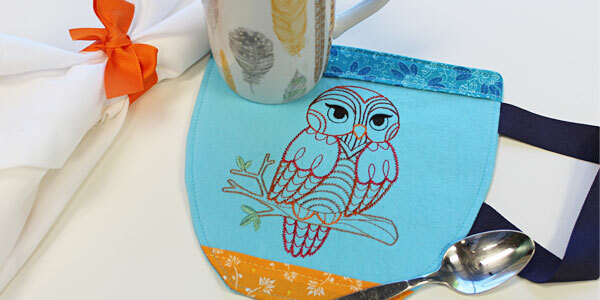 Perk up your table with an embroidered mug rug! 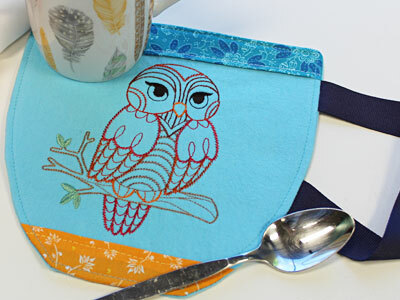 Not only will this tasty mug-shaped coffee rug protect your table while sipping on hot drinks, but it's also a terrific way to showcase your favorite embroidery and fabrics. 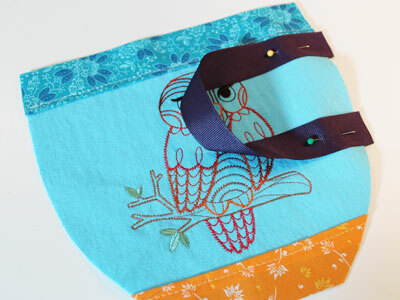 The design used in this example is K2645, What a Hoot! Monday (Vintage). Designs that are 5" x 7" or smaller work well with this project. Begin by printing a PDF of the mug rug pattern here. The pattern will print on two pieces of 8 1/2" x 11" printer paper. Cut out the pattern piece sections and tape them together. Cut a piece of flannel (or other cotton fabric) a little larger than your hoop. Pin the pattern piece on the fabric. 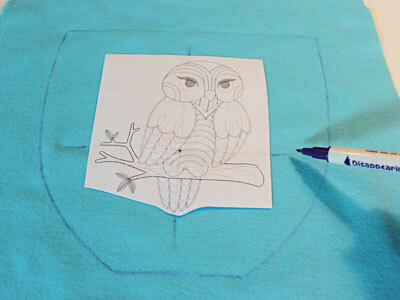 Use an air-erase pen to trace the shape onto the fabric. The design used here has "Monday" text, but doesn't work on the mug rug. We deleted the word with editing software. 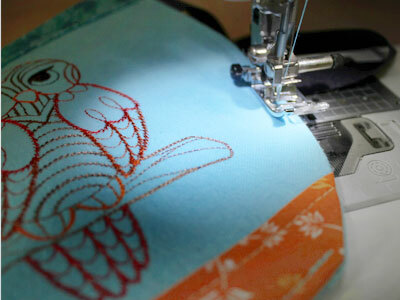 A template is a printout of a design, and it's an excellent tool to plan where to stitch. Place the printed template inside the shape, centered between the sides as well as the top and bottom. 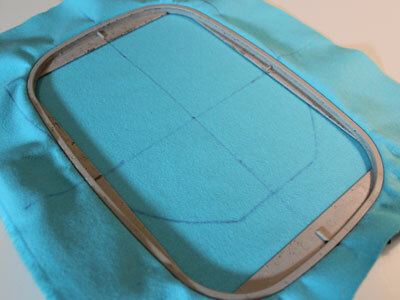 Mark the center point of the template on the fabric, as well as the vertical and horizontal axis line. Hoop the flannel with one piece of medium-weight cutaway stabilizer, lining up the marks on the fabric with the marks on the hoop. Attach the hoop to the machine and load the design. Move the hoop so the needle is right over the center point. After embroidering, cut out the shape. Cut two pieces of the printed quilter's cotton a little wider than the embroidered piece, and 2" high. 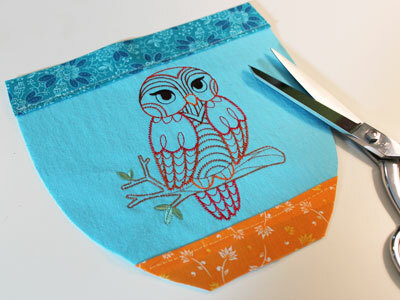 On each piece, fold one of the long edges over 1/2" and press with an iron. Place the fabric pieces on top of the embroidered piece, right sides facing up. The folded edges should face in towards the embroidery. 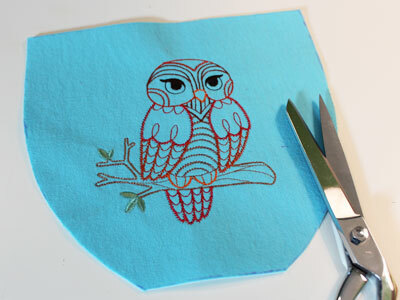 Leave about 1/4" between the folded edges and the embroidered design. 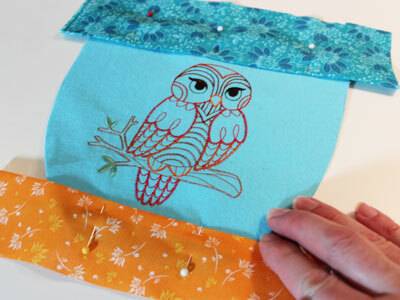 Pin the fabric in place and sew a 1/8" seam along the folded edges of the fabric only. Turn the fabric over to the wrong side. Trim the print fabric, following the shape of the embroidered piece. Place the embroidered piece on top of the fabric for the back. Pin in place, and cut around the edges of the shape. Unpin the fabric and set the back piece aside. Cut a piece of ribbon to 10" long. Place one end of the ribbon just under the top trim fabric, and the other end about 2" below. The loop of the ribbon should face in towards the center of the fabric. Pin the ends in place, leaving 1/4" of the raw ends of the ribbon extending out past the edge of the fabric. the assembled front piece, right sides together. Pin in place. 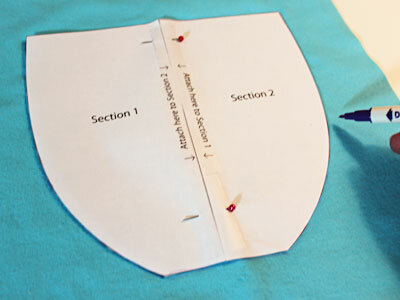 Sew a 1/4" seam around the side and top edges only, leaving the bottom edge open for turning. Turn the fabric of the opening in 1/4" and press. 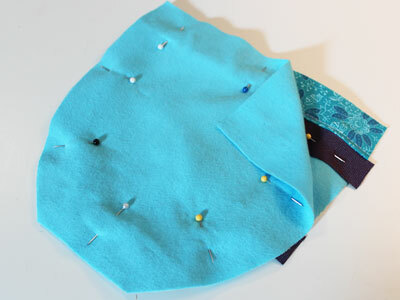 Pin the opening in place, then top stitch a 1/8" seam around the entire outer edges of the shape. Make this cozy mug rug for your own table, and warm the heart of your favorite coffee or tea lover with a mug rug of their very own, too! 5.91" x 9.45" | 4.88" x 6.89" | 3.94" x 3.47"